Water pumps, chillers, cooling towers, compressors, and similar equipment. Flexible rubber connectors are especially valuable in pipeline installations where electrolysis, corrosion, and water hammer are problems. 180° "U" bend to connect two vessels of the same diameter where flexibilty is required. 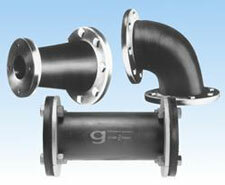 Fittings are available in Pure Gum Rubber, Neoprene, Buna-N, EPDM, Viton® , foodgrade polymers, Teflon, and more. General Rubber Corp., 11A Empire Blvd., South Hackensack, NJ 07606-1805. Tel: 201-6414700; Fax: 201-641-4710.